This rifle range belonged to a short-lived military installation known as Camp Harrington or Camp Admiral Harrington. Camp Harrington was established in July, 1905 as a rifle range for the USMC. It was located on the southern bank of the York River, just west of where Queens Creek joins it on some of the land now currently occupied by Camp Peary. 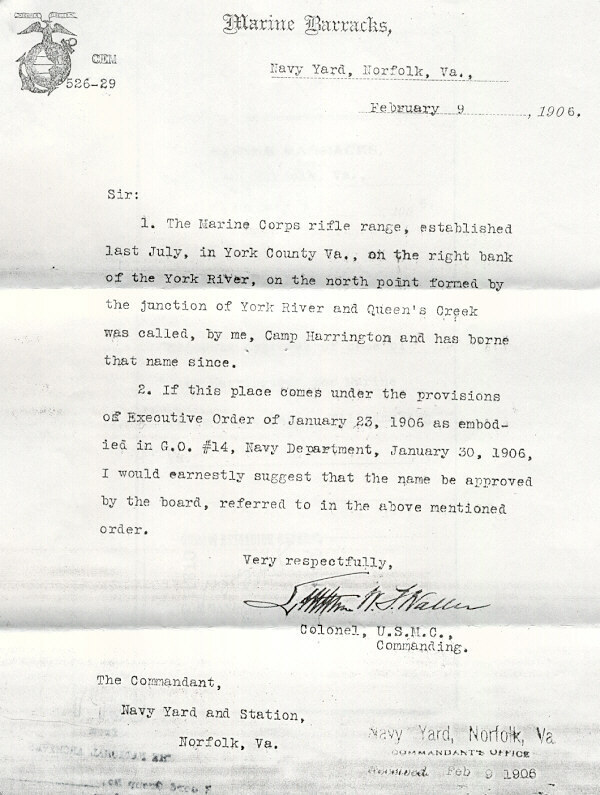 A 1906 memo regarding Camp Harrington. "In a hotly contested (hot because it was so) game of base ball last Saturday afternoon on Court Green between the Williamsburg and Camp Admiral Harrington nines, the local team won an easy victory from the soldiers. The score stood 7 to 14. There was a big crowd of rooters on hand." Some of the photographs in this series are from Camp Harrington and others are from Marine barracks in Norfolk. All are included for the sake of completeness. We build and fight with all our might!